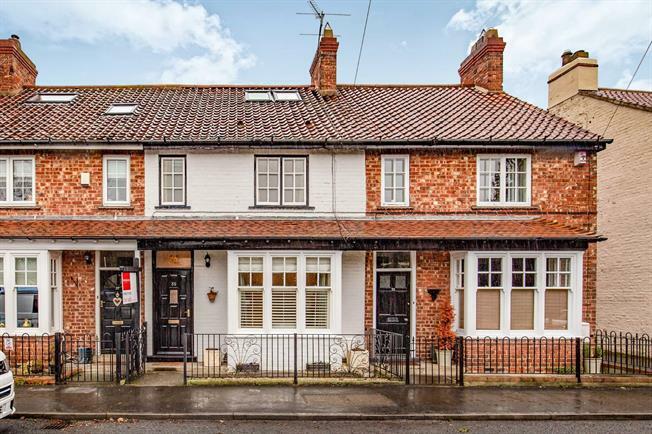 3 Bedroom Terraced Cottage For Sale in Yarm for Guide Price £249,999. Spacious throughout, this thee bedroom character residence is situated within the popular village of Hutton Rudby, superbly finished throughout, this well presented property offers light-filled and generous rooms over three floors. Briefly comprising of: entrance hall, living room, dining room, garden room, kitchen, pantry, landing, bathroom and two bedrooms with further landing and third bedroom. Externally the property offers a small yet private railed entrance with private walled garden to the rear. Welcoming entrance hall with stairs leading to the first floor, with doors to the living room and dining room. Light-filled living room with beautiful box window overlooking the front aspect, fitted with plantation shutters. With large cast iron open fireplace, floating bookshelves and original flooring. Open plan through to the garden room and kitchen, this useful room benefits from a large under stairs storage cupboard and floating book shelves. Generous pantry ideal for all necessities. Spacious, light-filled double bedroom with two windows overlooking the front aspect, finished with two built-in wardrobes and feature fireplace. Good sized double with window overlooking the rear aspect. Extremely generous bathroom finished to a high standard with modern shower unit, bath, WC and hand wash basin, with large heated circular radiator. Large double bedroom with exposed beams, two Velux windows and ample storage cupboards providing a wealth of storage. With railing to the front aspect providing a good level of privacy, the rear comprises of a spacious decking area with walled garden laid mainly to lawn. With outbuilding.